Toyo Ink SC Holdings plays a central role in the Group's unified governance. It develops Group strategies and performs tasks for risk management and accountability. Operating companies promote business under an optimal operation system in their fields, aiming to improve customer satisfaction and competitiveness. The holding company and operating companies fulfill their responsibilities to promote rapid response management, enhance management transparency, and maximize enterprise value. The Company shall continue to improve corporate governance based on the following approaches from the perspectives of sustaining the growth of the Group and enhancing its value in the medium and long term. Respect the rights of shareholders and make efforts to guarantee their substantial equality. Attempt appropriate collaborations with various stakeholders. Guarantee transparency by disclosing corporate information (including nonfinancial information) appropriately. The Board of Directors acknowledges its fiduciary responsibility to shareholders, and works to maintain and improve its functions. Hold constructive dialogues with shareholders that have investment policies in agreement with medium- and long-term shareholder returns. The Company's basic management organizations are the Board of Directors, the Group Management Committee, and the Board of Auditors. 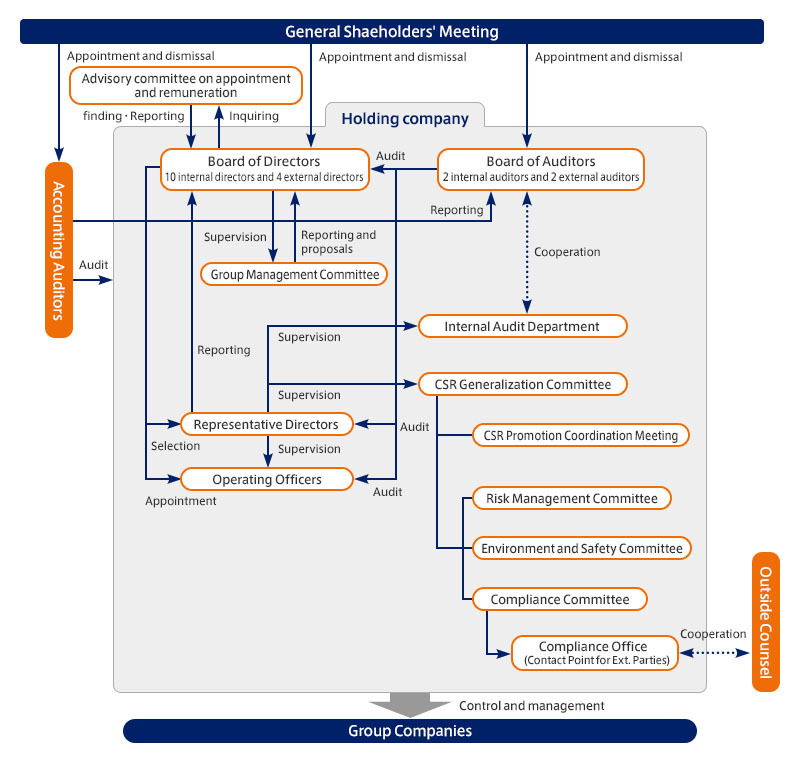 To clarify the separation between management supervisory functions and business execution functions, the Company has adopted an executive officer system in which the executive officer's term is for one year. The operating officer system has expedited decision-making and has strengthened the supervision of business execution. Toyo Ink Co., Ltd., Toyochem Co., Ltd., and Toyocolor Co., Ltd., each of which takes on global operations leadership in their business, hold operating companies' management meetings as needed to share management policies and strategies, as well as to discuss business challenges and results. This management system ensures the legality and appropriateness of decision-making over general management and the effective supervision of business execution. The Group has established a governance system that is integrated with its Corporate Social Responsibility (CSR) management and gives thorough consideration to the environment and safety in addition to managing all kinds of risks including risks related to intellectual property, information security, receivables, and natural disasters using a Group-wide risk management system. The Group aims to instill awareness of ethics and compliance in all people working for the Group and has established a compliance system which includes points of contact for consultation and reporting within and outside the Group. The Group Internal Audit Department conducts internal audits to check that all of these systems are functioning properly.